BARTEC stainless steel housings and distribution boxes are designed and approved for Zone 1 and 2 as well as Zone 21 and 22. They are particularly suitable for applications under extreme environmental conditions, and they provide reliable protection under heavy loads. The housings are made from 1.4301 (V2 A) or 1.4404 stainless steel (V4 A). 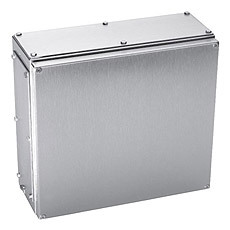 The series includes empty housings and distribution boxes with door or cover. From a housing height of 120 mm, the housings can be supplied with or without flange plates. In addition to 25 standard sizes, approved customer-specific design variants are also available. The scope of delivery includes wall attachment straps, internal and external PE connection, as well as a mounting plate for the empty housings/distribution cabinets.